Many times in the New Testament the Christian life is referred to as a “walk”. John goes even further and says that our walk can be in light or it can be in darkness. Just as an infant learns to walk and overcomes different challenges, the Christian must learn to walk in the light. In this passage John uses the contrast of light and darkness to challenge readers about authentic Christianity. In “light”, John is referring to holiness and purity, while “darkness” refers to sin and worldliness. The emphasis is that these two symbols are complete opposites and can’t exist together. John also talks about those that “walk” in darkness, which shows a continued pattern of the lifestyle. As believers in Christ we may occasionally “step” in darkness, but our convictions will not allow us to stay there. Think about your life as being the “only Bible that someone will ever read.” If someone watched you for a full day and recorded everything they saw and heard, how would they describe a Christian? Would there be a clear picture of who God designed us to be? What about the people you spend your time with, your friends and family? Are they living in the light?. Nobody is perfect. It’s not about perfection; it’s about progress. What changes can be made in your life that can keep you walking in the light and away from the darkness? 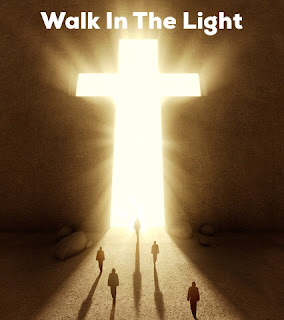 Dear Lord, help us to walk in the light. Help us to have the strength to share the light You have put in us so that those around us will see You. In the Name of Jesus, Amen.